Are you building a new home or building or remodeling your property? You will most probably need a new and efficient HVAC system that will suit the requirements of your new or renewed home or building. Here at Green Air Heating and Conditioning, you can count on HVAC solutions that are not only efficient, but also come in the best prices available and equipped with the latest features and technologies. Our staff can help you make an informed purchase by helping you sort through the maze of HVAC equipment on the market, from furnaces, air conditioners, boilers, heat pumps and air handlers. 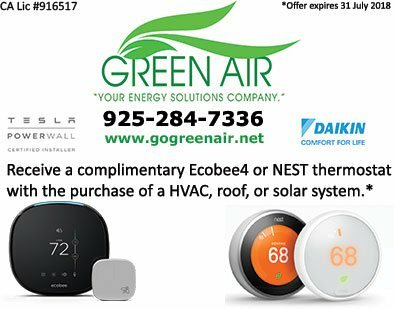 Since Green Air is a volume buyer, we get the best pricing available–and to further bolster your confidence, Green Air employs one of the top installation teams in the state for new construction and remodeling projects in Concord, CA and nearby communities. In the past few years, HVAC technology has seen significant technological advances in efficiency and integration. If your HVAC system is more than 10 years old, you may want to consider installing a new HVAC system. You will gain improvements to your comfort and health while using high-efficiency components to reduce your ongoing energy costs. Central heating unit. We specialize in the installation of American Standard units that give the highest efficiency. Central cooling unit. Upon evaluating your needs, we will recommend and install the ideal air conditioning system that fits your property’s requirements based on size and climate. Ductwork. With our efficient ductwork system, the quality of air and comfort in your home or property will tremendously improve. Get in touch with Green Air Heating and Air Conditioning today by calling us at (925) 284-7336 or leaving a message in our online contact form. We will schedule the best time to discuss your new construction and remodeling requirements so we can recommend the best HVAC and other solutions for your property.